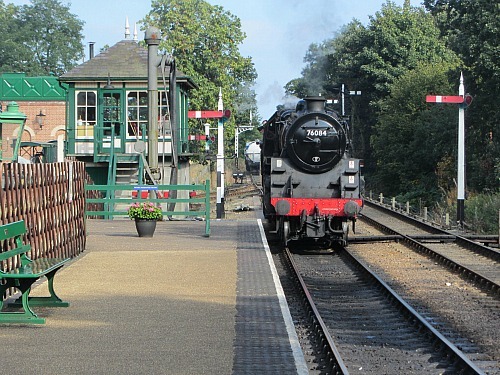 The Poppy Line, also known as the North Norfolk Railway, is a beautifully and lovingly run Heritage Steam Railway that gives you the chance to lose yourself to nostalgia and forces you to just sit back and enjoy the slower pace of life that once was! And all ages will love it! 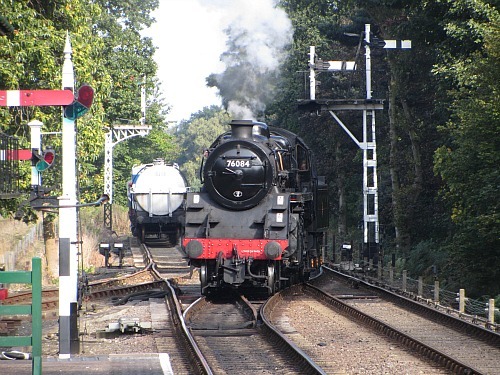 The Poppy Line, which runs from Sheringham to Holt on the North Norfolk coast, is one of the 5 great heritage lines in the UK, so if you’re wondering what to do for a day in Norfolk, then here’s your answer! It’s almost a four-in-one offer! They also put on numerous special events throughout the year, so there's always something for everyone! 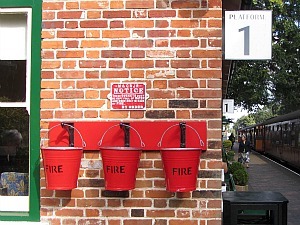 Arriving at Sheringham railway station, the steam engine and carriages will be awaiting your arrival. Steam puffing out of the funnel and the train raring to go! But don’t rush to get on the train yet because there will be things you want to see. Buying your ticket is where it all starts! The ticket office doesn’t look like it’s changed much since it was used in the days of steam back in the 1950’s, and the old suitcases and trunks in the office and on the station gives you a real sense of what it was like many years ago. The same can be said for Holt station too where everything looks so authentic. 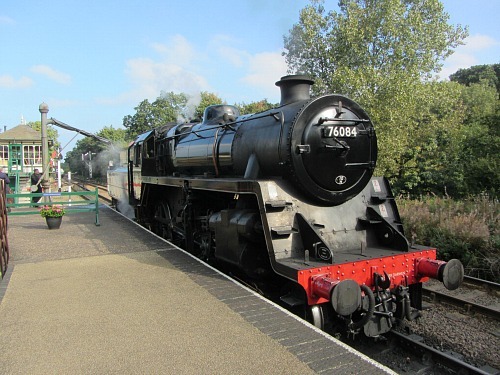 Take some time to wander up and down the platform, admire the steam engine, and the carriages. 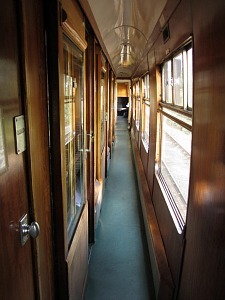 The carriages are all different, so you can pick and choose where to sit. You could pick an open carriage, or one of those ones which have a corridor down one side of the carriage and you have to open a door to an enclosed seating area with about 6 or 8 seats. We had great fun deciding which one to go and sit in! We even wandered right to the end of the train where the volunteers sit and had a lovely long chat to one gentleman who was telling us all about how they had restored the carriages and how they had enough work in the repair yard at Weybourne to keep them busy until 2026. 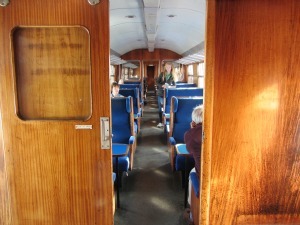 We caught sight of a buffet car in the sidings, and a beautiful wooden bodied coach which is used for special events. 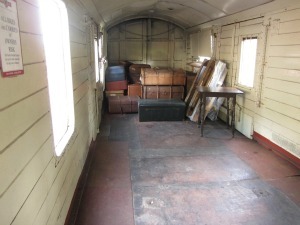 And we had a peek into an open goods carriage full of trunks and suitcases, exactly as it would have been years ago. 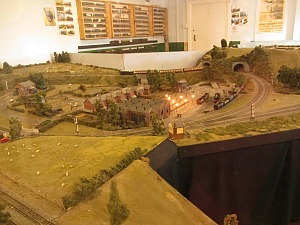 The amazing thing about this railway is that it is run almost entirely by volunteers. They are all so friendly that it’s a delight to be amongst them. Most of them have either worked on steam trains or have always had a passion for them! Their friendliness and willingness to give you little snippets of information gives the whole outing a really wonderful atmosphere. So from Sheringham, the first stop is at Weybourne station where you can get off if you want to. Don’t forget, that if you get a roving ticket, you can get on and off the train all day. So this really is an all-day affair if you want it to be. 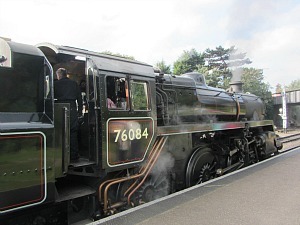 Why not bring a picnic and either have it at one of the picnic tables at Weybourne, or better still, walk from Weybourne to Sheringham Park, up to the Gazebo, where if you time it right, you’ll get the most fantastic view of the steam engines puffing along the line. If you look at the timetable you’ll be able to see when the next steam train goes past. Or you could walk to the beach at Weybourne and then follow the Norfolk Coast Path all the way back to Sheringham along the cliff path. 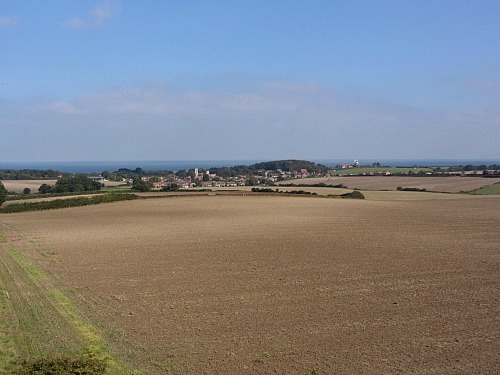 The poppy line passes along some of the most beautiful stretches of the North Norfolk Coast, with views overlooking the sea, it’s really pretty. 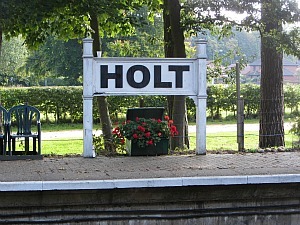 The poppy line finally stops at Holt. 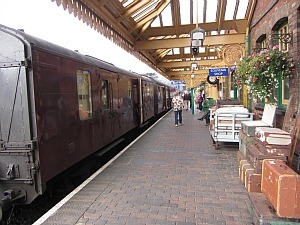 Here you will have plenty of time to watch the train changes track, puff out more steam, manoeuvre itself to the other end of the carriages, and watch it being filled up with water and eventually join to the carriages to take you back to Sheringham. Holt’s a lovely little station, where you can spend some time looking at the working model railway, which is great fun, having a picnic on the picnic tables, visit the restored M&CN Goods Shed which houses the William Marriot Museum (William Marriott being the man who built the railway in 1887 and ran it until 1924). 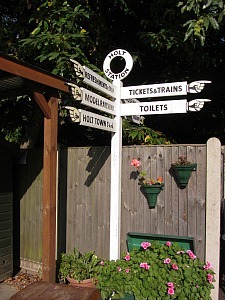 It’s all beautifully kept, with flowers in tubs, old nostalgic fire buckets and authentic signs and signposts dotted around the station. There’s also a little shop where you can buy tea and coffee and snacks. 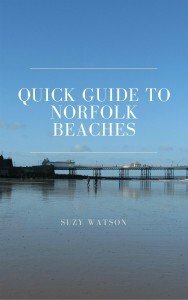 The North Norfolk Steam Railway holds so many events during the year, where do I begin! 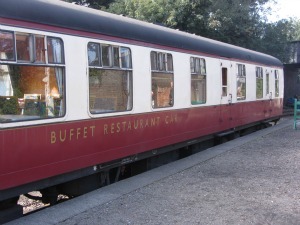 You can go on a Sunday Lunch train, or an Evening Dinner train, Fish and Chip Real Ale Train and even a Murder Mystery Train! But I think it might be worth you visiting the Poppy Line North North Railway Special Events page here for more detailed information. Car parking at Sheringham is very easy. There is a large car park with a pay and display machine adjacent to the railway station. Parking at Holt is free at the railway station. “I’m escaping for the day”. 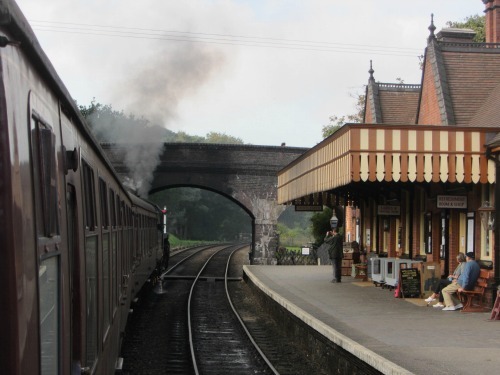 Nostalgia is very high on the list with a trip on these wonderful steam trains – even if you’re young. I don’t remember steam engines (!) but the enjoyment I got from my day out was fantastic. 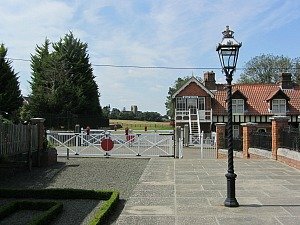 And if you want to go back in time again, Wolferton Royal Station is a fantastic museum near Sandringham which again has been lovingly restored and has an incredible history attached to it.